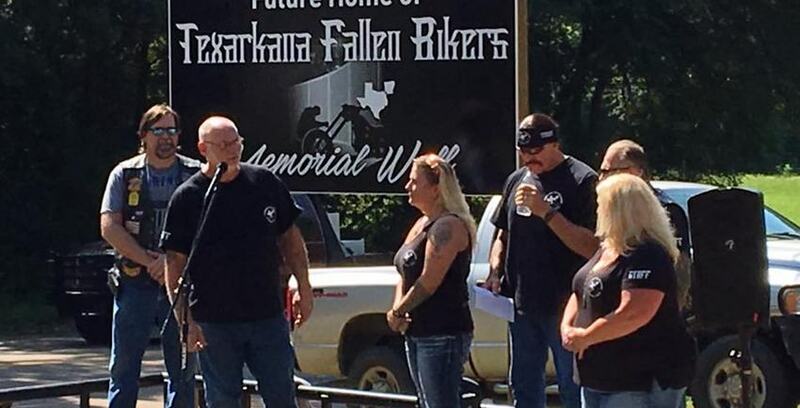 Members of the Texarkana Fallen Bikers Memorial Wall gather during the summer. According to Mike Thacker, Co-Founder of the Texarkana Fallen Bikers Memorial Wall, everyone in Texarkana, TX, knows or is related to someone who has been killed while riding a motorcycle. Mike, along with other bikers in the area, wanted to do something to memorialize those who have lost their lives while riding. Accidents are common along the Texarkana’s highways and byways. It seems old methods of awareness and prevention don’t work as well as they used to. Raven, Co-Founder along with Mike, says that the “Look twice, save a life.” campaign many years ago was successful, but that now people are too used to the signs and don’t give them a second thought. Motorcycles at a summer Texarkana Fallen Bikers Memorial Wall event. The organization has purchased more than 16 acres in Texarkana and is in the process of clearing land for a park to house the memorial wall. The Texarkana Fallen Bikers Memorial Wall is a 501c3 and their projects are being funded completely by donations raised at fundraisers, including their annual May auction and weekend bar-b-ques. Thank you to the Texarkana Fallen Bikers Memorial Wall for letting us pitch in by providing storage space and monetary donations for the park they’re building. We know the community will appreciate this thoughtful act for years to come.